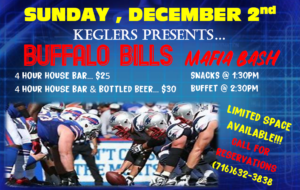 Join us for our next Buffalo Bills MAFIA BASH, Saturday, December 2nd! Food, football & fun! We are filling up fast so call and reserve your spots ASAP!!! PreviousPrevious post:New Year’s Eve 2018NextNext post:Birthday Parties at Transit Lanes are a Blast!